This Rolled Arm Chair is a lovely piece to add to literally any home - with over 600 upholstery options and a variety of wood finishes to choose from, there is sure to be a color or pattern to match almost any home! Its traditional elegance brings a special touch of sophistication to your home. It features beautiful rolled arms, and intricately carved wooden legs. The seat back and front panel both feature button tufted designs. Welt cord trim decorates the seat cushions and arm panels. You will love the look of this chair in your home, especially after customizing it to match your own style and decor. The Berkshire Rolled Arm Chair with Button Tufting by Kincaid Furniture at AHFA in the area. Product availability may vary. Contact us for the most current availability on this product. The Berkshire Collection is a luxurious and elegant group of seating options that you can customize to fit the decor of your home. With over 600 exciting upholstery options, there is sure to be a look or two that matches your style. 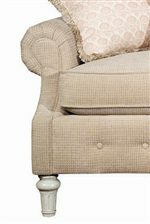 The Berkshire collection features rolled arms, button tufting, decorative accent pillows and carved wooden legs. The collection includes a sofa, loveseat, chair and ottoman. The loveseat is not shown, but is available. The Berkshire collection is a great option if you are looking for Traditional furniture in the area. Browse other items in the Berkshire collection from AHFA in the area.